Some years ago (June 27, 2007), Harvard economist Dani Rodrik outlined what he called his “impossibility theorem”, which said that “democracy, national sovereignty and global economic integration are mutually incompatible: we can combine any two of the three, but never have all three simultaneously and in full”. In his brief article – The inescapable trilemma of the world economy – he made the case that “deep economic integration required we eliminate all transaction costs … in … cross-border dealings” and that “Nation-states are a fundamental source of such transaction costs”. Ergo, if you want ‘deep’ integration then the Nation-state has to surrender. His “trilemma” guides his view of how the “international economic system” should be reformed. He think that if “want more globalization, we must either give up some democracy or some national sovereignty”. This view has been adopted by political parties as if the conceptual framework is in some way binding. The trilemma has been skillfully sold as a narrative by right-wing think tanks and others who serve the interests of capital. The so-called progressive politicians have fallen into the trap and have shifted their political parties closer and closer to their right-wing opponents, such that now it is hard to distinguish between the major parties in most nations. The reality is that while the impossibility theorem beguiles the Left – its applicability as a binding constraint on government is limited. It is as vapid as the statements made by these career politicians on both sides of politics that they serve the people. The UK Guardian article (February 16, 2016) – The issue is not Hillary Clinton’s Wall St links but her party’s core dogmas – has some bearing on our discussion. It discusses the “rise of Bernie Sanders” and the problem that Hillary Clinton has in terms of credibility from the perspective of what the Democratic Party now stands for. The author (Thomas Frank) argues that there had been growing tension in the Democratic Party from the 1970s on as to what it stood for. What Democrats had to turn away from, reformers of all stripes said in those days, was the supposedly obsolete legacy of the New Deal, with its fixation on working-class people. What had to be embraced, the party’s reformers agreed, was the emerging post-industrial economy and in particular the winners of this new order: the highly educated professionals who populated its clean and innovative knowledge industries. ather than paying homage to the politics of Franklin Roosevelt, Clinton passed trade deals that defied and even injured the labor movement, once his party’s leading constituency; he signed off on a measure that basically ended the federal welfare program; and he performed singular favors for the financial industry, the New Deal’s great nemesis. The so-called “untenable consensus of the new deal” was finally abandoned. The so-called progressive reality check was now accomplished and the Democratic Party could move into the new era as a leading force in what was required in statehood. The problem is that the so-called ‘reality check’ was nothing of the sort. It was actually a surrender to the destructive logic of capitalism and the vast array of resources that had been assembled by those on the Right to dismantle the apparatus of the state and tilt the playing field firmly in the direction of capital. It was the result of a long fought campaign to restore the conditions that capitalism confronted in the late 19th century. By that I mean to retrench the gains made in the post-Second World War period that had improved working conditions for workers and provided income support to those unable to work for whatever reason. It was also a campaign designed to privatise the public wealth that it been built up in this period (that is, public infrastructure et cetera), without a commensurate commitment to the logic the created that wealth in the first place – that is, to advance collective well-being. As we slide ever deeper into the abyss of inequality, it is beginning to dawn on us that sinking the New Deal consensus wasn’t the best idea after all. It is clear from the way the modern Democrats fawn over Wall Street still and the handouts they provide “to bid for the favor the tech industry, and big pharma, and the telecoms, and the affluent professionals who toil in such places … telling working-class Americans that little can be done about their ruined lives” that the Party has lost its connection with the constituency that it previously served. It now propagates the narrative “that the downfall of the working class is the inevitable price we pay for globalization” and this myth has become “essential to their identity”. This is why Bernie Sanders appears to be so compelling. He is challenging the very identity of the Democratic Party and proposing a “political revolution”. This tension is not confined to the US, of course. Social Democratic political parties have followed a similar course over the last 3 to 4 decades. In effect, by adopting neo-liberal economic beliefs, there has been a convergence of the main political parties, and then a shift further to the right. This ‘convergence’ has all but rendered these main antagonists indistinguishable as both now serve the vested interests of financial capital and deliberately undermine the well-being of the working class, albeit their rationalisations of what they are doing is superficially different. However, observing and opposing the way in which so-called progressive political parties have become co-opted by the financial and industrial elites is one thing. Challenging the notion that this new narrative from the Left is just a reflection of inevitable trends is another matter altogether. When it comes down to defining terms their position weakens considerably. Consider Dani Rodrik’s impossibility theorem, which is often used to articulate the new Left assertion that the nation-state is unable to guarantee full employment if international capital is opposed – which is told as an unchallengable truth. He summarised the argument in his blog – The inescapable trilemma of the world economy. A full academic argument is presented in his Journal of Economic Perspectives paper (published 2000) – How Far Will International Economic Integration Go? [Reference: Rodrik, D. (2000) ‘How Far Will International Economic Integration Go?’, Journal of Economic Perspectives, 14(1), 177-186]. … cannot simultaneously maintain independent monetary policies, fixed exchange rates, and an open capital account. For example, if a nation chooses to peg its currency and allow capital flows to enter and exit without restriction, then it cannot also, independently said its own interest rate. Under the Bretton Woods system of fixed exchange rates, a country with a current account deficit would have to do, among other things, push interest rates up to repress imports and attract capital inflow, as a means of maintaining the agreed exchange rate parity with other nations. If it wanted to set its own interest rates, then it could impose capital controls which would help it maintain a fixed exchange rate, or, alternatively, it could allow its currency to float without imposing capital controls. In other words, adjustments to shifts in the preferences of international capital, can either be borne by the domestic economy (so fixed exchange rate nations running current account deficits had to be willing to suppress domestic economic activity with the resulting political consequences) or by exchange rate fluctuations (the same nation would. in all probability, face a depreciating exchange rate). Rodrik introduced a new type of trilemma, which he called “the political trilemma of the world economy”. 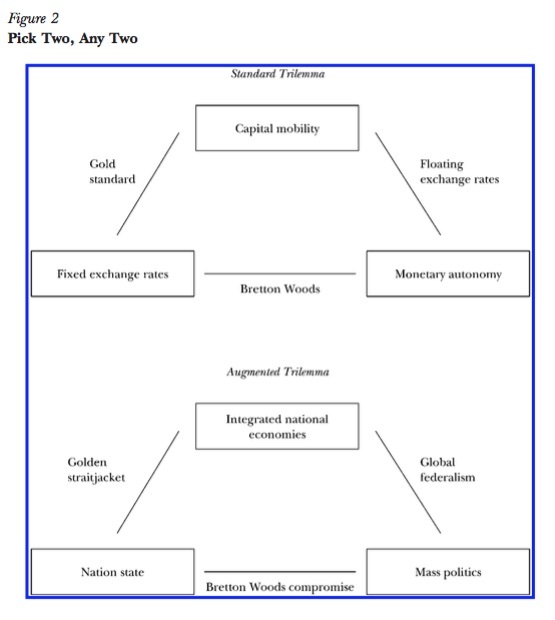 The following diagram is taken from his Figure 2 in his 2000 paper and shows the standard open economy trilemma, described above, and he is political trilemma (lower panel). I use the term “nation-state” to refer to territorial-jurisdictional entities with independent powers of making and administering the law. I use the term “mass politics” to refer to political systems where: a) the franchise is unrestricted; b) there is a high degree of political mobilization; and c) political institutions are responsive to mobilized groups. In his blog, he slips in the term “Democratic politics” to replace “mass politics” (which is the 2000 paper terminology), but clearly, the two concepts are somewhat different. When he says that “mass politics” is about political institutions being “responsive to mobilized groups” this does not preclude the lobbying industry skewing policy to suit vested interests, which actually undermine the democratic intent of the system. His trilemma is that a nation can only have two of the three options. If we want true international economic integration, we have to go either with the nation-state, in which case the domain of national politics will have to be significantly restricted, or else with mass politics, in which case we will have to give up the nation-state in favor of global federalism. If we want highly participatory political regimes, we have to choose between the nation-state and international economic integration. If we want to keep the nation-state, we have to choose between mass politics and international economic integration. While the ‘nation-state’ is typically thought of as a sovereign state with legislative powers, under the scenario where there is “true international economic integration”, the nation-state has to “to ensure that national jurisdictions — and the differences among them — do not get in the way of economic transactions”. In this context, the political aspect of the ‘nation-state’ shrinks and policy making is increasingly taken over by technocrats advised by institutions such as ‘Parliamentary or Congressional Budget Offices’ which define fiscal and other rules that the polity has to meet. … the shrinkage of politics would get reflected in the insulation of economic policy-making bodies (central banks, fiscal authorities, and so on) from political participation and debate, the disappearance (or privatization) of social insurance, and the replacement of developmental goals with the need to maintain market confidence. He cites Thomas Friedman’s 1999 terminology for this option – the so-called “Golden Straitjacket” where mass politics gives way to rule by technocrats serving the interests of global capital. Clearly, the Bretton Woods system broke down because the political process could no longer mediate the tensions of maintaining the exchange rate regime with (even imperfect) capital flows (the manifestation of increasing global integration). The excessive unemployment and suppression of material living standards that that system brought were politically unsustainable. Rodrik, however, considers that the system, did leave “enough space for countries to follow their own, possibly divergent paths of development” because certain restrictions on capital flows and trade were accepted by the system. However, the collapse of the system was evidence that the domestic restrictions embodied in the fixed exchange rate among quite different types of economies and cultural backgrounds were unsustainable. The trade restrictions (for example, import tariffs, and restrictions on capital flows) did provide some policy room to national states. But not enough! There are several points worth noting in relation to his thesis. … markets for goods, services, and factors of production are perfectly integrated. He says that the term “globalization … is a term that is used in different ways by different analysts” whereas the term “international economic integration” is rather distinct in meaning. Further, the latter term “does not come with the value judgements – positive or negative” – that the term ‘globalization’ seems to trigger in knee-jerk fashion”. This is no small issue. Rodrik, himself, acknowledges that (as at 2000), the world is “quite far” from what he calls “true international economic integration”. The creation of multinational firms with increased vertical integration and global supply chains has been going on since the 1960s (if not earlier). But it was in the late 1960s and 1970s, that the transport, technological and communication advances made it possible for firms to go global. Contrary to conventional wisdom and much punditry, international economic integration remains remarkably limited. This robust finding comes across in a wide range of studies, too numerous to cite here. The concept of a national border remains. There is still exchange rate uncertainty despite increased deregulation, which has lowered the transactions costs of international trade. There are still major “cultural and linguistic differences” that preclude a full mobilisation of resources across national borders. Rodrik notes that “Investment portfolios in the advanced industrial countries typically exhibit large amounts of ‘homebias;’ that is, people invest a higher proportion of assets in their own countries than the principles of asset diversification would seem to suggest”. There is still a high correlation between “National investment rates … and … national saving rates”. Even in periods of exuberance, capital flows between rich and poor nations fall considerably short of what theoretical models would predict. Real interest rates are not driven to equality even among advanced countries with integrated financial markets. Severe restrictions on the international mobility of labor are the rule rather than the exception. Even the Internet, the epitome of technology-driven internationalization, remains parochial in many ways; for example, Amazon.com feels compelled to maintain a distinct British site, Amazon.co.uk, with different recommendations and sales rankings than its American parent. The same points can still be made today (16 years after this article was published). National borders remain cogent because they “demarcate political and legal jurisdictions” that impose transaction costs, and hinder “contract enforcement” rules. This is why the embrace of so-called Left political parties of ‘free trade’ agreements with ‘investor dispute resolution’ mechanisms is so dangerous and is, in a way, a beach head that has to be defended. The point is that despite the flowering of global firms and supply chains, there is nothing like ‘true international economic integration’, which means the nation-state can still reflect local politics and these constructs that place power in the hands of unelected technocrats (fiscal agencies and central bankers) are unnecessary and the Left should oppose them at the political level. Second, the trilemma as expressed is tautological. Of course, it is a definitional truth that if we allow capitalism to have no limits, then nation-states either disappear as legislative vehicles with enforceable jurisdictions (and confine themselves to being servants of global profit making) and/or citizens lose any political rights. All local policies would be designed to serve capital and democracy as we know it (slippery as the term is) would take a backseat. But, as noted above, there is nothing inevitable about a trend to ‘true international economic integration’ and the current state of global capitalism is nowhere near that ‘pure’ state (you use pure in the terms of the mainstream textbook rather than implying anything of value or a state to be desired). So, in fact, this trilemma is just a notional construct. The actual reality that we face is that we still can elect politicians in most countries (mass politics), these politicians still have legislative capacity to restrict economic activity across borders, and global capitalism still requires local markets to realise the surplus value they produce within these global productive processes. The actual challenge is not to cede national sovereignty to some mythical state of international economic integration but to resist the corruption of the national policy-making process by shifts to technocracies and to ensure that the voting systems, both by citizens for their elected representatives and by the representatives themselves in the legislative domain, is not corrupted by lobbyists working in the interests of specific capital elites. This is why I think Bernie Sanders has so much appeal. Unlike Hillary Clinton, he is not seen as part of the Democrat machine, which has all but surrendered its autonomy to the likes of Wall Street. He is savvy enough to understand that the currency-issuing government with the power to enforce legislative decisions can act broadly in the interests of the well-being of all citizens and can stand tall against the powerful capitalist interests that are continually attempting to skew the power of such a government in their favour. The fact that billions are pumped into the lobbying industry each year by the major industrial and financial capitalist interests and that these efforts are supported by massive funding of think tanks and marketing agencies, which are designed to skew the opinions of ordinary voters, is testament that global capital, however concentrated, understands the power of the elected nation-state. The problem is that the stupidity of the Left politicians has bought the myth that international economic integration is so advanced and inevitable that they had to abandon the traditional progressive goals and, instead, serve the interests of capital. Their differentiating narrative is the implausible claim that they somehow will maintain that policy position to deliver fairer outcomes. It’s laughable really. What Bernie Sanders understands is that the conditions that are required for, say, the full employment of all workers who desire jobs, remain exactly the same as they were in the 1930s, when the New Deal was introduced to combat the mass unemployment that followed the onset of the Great Depression. Whatever internationalisation of capital that has occurred since then, the conditions under which a currency-issuing government can sustain full employment of all the domestic productive resources have not changed. In general, those conditions require such a government to run continuous and fluctuating fiscal deficits. They do not require such a government to issue any debt, nor deregulate anything. It is time that the Left grasped that reality. I don’t think they’ve bought the myth. It is what they desire. The internationalist left believes fervently in the One World view. It’s part of their core beliefs – a world without borders. And they really don’t care who they have to sell down the river to accommodate that belief. I see it everyday in the arguments over the EU. “We must work to create change from within”, which of course means that change will never happen until everybody agrees. And since everybody won’t agree then nothing will change. But change isn’t the point. It is constantly fighting for the change that’s the point – since that is what gives these people purpose. It’s the give a man a fish a day so that they are always dependent upon you, rather than teaching them how to fish so they no longer need you. If you look around a lot of the modern world, charities, businesses and lobby groups, you see a lot of this ‘create a permanent dependency’ structure. They see more value in the ‘struggle’ than in actually achieving anything. A centralised highly coupled world serves only the globalised corporates who will control it via their integrated power structures. Instead we should be pushing for a largely de-coupled world full of cohesive nation states that each offer different environments and different viewpoints for people to live in. Since the currency is always a monopoly whether you like it or not, you must choose who runs it. People you have some control over, or people you don’t. “In general, those conditions require such a government to run continuous and fluctuating fiscal deficits…..
And yet John McDonnell was talking about balancing budgets, ‘earning money’ and ‘unsustainable spending’ again last night. No doubt his band of (mainly) technocratic economic advisers ‘advised’ these lines to appear ‘credible’. Maybe his own team don’t want him to move away from the household budget narrative? I can only hope they can learn a thing or two from the Sanders team soon. Some good points there Neil. Is this a confusion in the Left about the meaning of ‘internationalism’? I mean that neo-liberalism has appropriated it leaving the Left disarmed without realising it. I can remember a British Airways advert from the 80’s showing a plane bent and knotted around the globe telling us we can now go everywhere and it was all connected, it all sounded like the ‘Internationalist’ dream was realised but we got globalisation and corporatist hegemony instead. The Eu debate is linked with that I think without people distinguishing the EMU from the EU in general. You say: “a largely de-coupled world full of cohesive nation states that each offer different environments and different viewpoints for people to live in.” But don’t we need a LOT of co-ordination in terms of resourse use and environmental impact? We’ve got the technology to rationally co-ordinate all this so the import export ‘beggar-thy-neighbour’ system can change . Mike Wright – I’ve read that Sanders is being advised by Stephanie Kelton but has to be careful what he says (such as ‘Taxes don’t pay for services’) as the public are nowhere near ready for this as too much myth-busting still needs to be done. In the case of McDonell I’m not sure what sort of powder is being kept dry! Until we’ve got discussion groups going on this in every community centre/pub/village hall -the fug of economic myths will never clear. Yes Neil, I think you’re right. And I think this is what Frank often points out: the salaried, “educated” left are actually part of the problem. They’re severely dim and rather than thinking things through or constructing a coherent ideology they vote with their stomachs. They love open borders because it suits them and their ideological biases — not because it is a rational policy in and of itself. They are remarkably easy to flog some vague and impossible dream to — Europe being the best example but their are others. And at the end of the day they are more interested in cultural politics than anything else because it requires very little thought. It’s these lazy, stupid and myopic people that will hand the election to Clinton. I had noticed the Impossible trinity before but not examined it till now. I don’t believe any such construct is inevitable and in any event the rising forces of globalization [etc] are in reality speeding the world economies towards collapse. That is now inevitable. We just don’t yet know what will trigger it but with BAU in this finite world it cannot be denied. Most of these discussions have taken place after our world’s economies achieved their greatest benefit between 1965 and 1970 and ever since then the road has been trending downwards. Read Gail Tverberg “Our Finite World” for more. On another point you mention, Bill, I think the left has betrayed its base and as such are worse than the right. Labor here, and Labour in the UK, the Democrats in the USA are now wallowing around uselessly. Mostly they have nothing to contribute, even they are not as loony as Republicans, who have their own problems with their base. It’s going to be an interesting time if Corbyn and Sanders can recharge the left. Sanders at least has Stephanie Kelton as advisor, although he’s probably chosen to not stir that pot yet. Corbyn desperately needs someone similar. But I am afraid a] we don’t have the luxury of time. and b] we need a big blue to wake people up from the current miasma and consider a new economic paradigm. But these are truly impossible to happen together. I suppose I am one of those “stupid, lazy, and myopic people” who “love open borders because it suits them and their ideological biases”. In other words, I am a UK citizen who favours continuing membership of the EU, and “ever-closer union”. There are historical reasons, I would say, why an integrated Europe is a good thing. You in the USA have open borders between your states, after all – you fought a bloody war for that, as we have fought bloody wars in Europe. I would not like the UK to leave the EU because that would not stem the myopic and stupid pursuance of neo-liberal economics within the UK: it would rather favour that tendency in my view. I would like to see increasing democracy, both within the UK and in the EU as a whole; this has been opposed and held back by those arguing for a withdrawal behind our national frontier; at the same time, the same people point to the democratic deficit in the EU as a reason for withdrawal. The pursuit of greater democracy and closer integration within the EU is not in my opinion a lost cause; on the contrary, more and more people are seeing the necessity for it. A democratic and integrated Europe can still be a strong force opposing the trend towards greater globalization and corporate power, far stronger than individual European countries on their own. This is the no doubt naive view of a non-economist. Democracy and the nation-state go together. The word nation-state is overused nowadays to refer to any sovereign state. However, a nation-state is really a state whose citizens, or the majority of whose citizens, all belong to one nationality. The reality in today’s world is that most sovereign states are multinational. Multinational states tend to be governed in authoritarian fashion, fall apart or else have to become extremely federal. In Europe, the Soviet Union was a multinational state and it fell apart after it no longer was authoritarian. Belgium has gone from a unitary state to a much more federal one because it is binational. If Cyprus had been an all-Greek country, it would not have fallen apart and probably already joined Greece. The only really multinational mass institution in the world is the Catholic Church, and I hardly need to point out that it is not governed in a democratic fashion. If everybody in Syrian were Sunni, it would be much easier to establish democracy there. The more homogeneous a country is, the more likely it is to be democratic. If everybody, or nearly everybody, in the country is Swedish, white and Lutheran, then democracy can function more easily because, whichever party wins the election, the government will consist mainly or totally of Swedes, Lutherans and whites. The same applies to economic and educational homogeneity, also known as equality. Democracy is more likely to take root if there is only modest economic and educational inequality. A broad ideological consensus also favors democracy. The bigger the political unit becomes, the more diversified it is likely to be and the more difficult it will be to have genuine democracy. Can anyone imagine a real democracy within the EU? A democracy at world level can’t function. The trilemma is really a dilemma. If we really want a global economy, then we can’t have democracy and we can’t have nation-states. We’ll need a global government, and such a global government could only be democratic if the world population becomes homogeneous. Closer economic integration between countries is not important at all. It is important only to global capitalists, who want to make profits everywhere. Suppose that we had only local landlords. Then it wouldn’t matter if every municipality had its own building code. However, if there are landlords who have buildings all over the country, then it would be more efficient for them if every municipality had the same building code. As to trade, it is true that diversity is a hindrance to trade. If everybody in the world spoke the same language, then it would be much easier to sell one’s goods everywhere. However, the importance of international trade can be overestimated. Suppose that the world were a complete free trade area but that technology were at the level of 1900. Now suppose that every country were protectionist but that every country were at the same technological level as Australia. In which case would the world be more prosperous? Obviously, in the second case. Far more important than open borders for goods and capital is to to have open borders for knowledge and know-how. If knowledge and know-how can cross borders, then productivity-enhancing knowledge can generate economic growth everywhere. Rodrik’s impossibility theorem is not carried by any real proof. Unlike Arrow’s impossibility theorem, where there is a proof albeit an enthymematic one. I like R’s paper and agree that the three factors he selects are difficult to reconcile and that this in itself deserves discussing. But that is far from showing such a reconciliation to be impossible. Impossibility theorems are very hard to come by. I would be quite surprised if his brief remarks hide a real impossibility proof. I would think he picked the title for his article because it was catchy, partly because it harkened backed to Arrow’s theorem, and because reconciling the factors in question were going to be a hard nut for anyone to crack. Nicely argued and much appreciated. I hope this piece gets the attention it deserves. I don’t think we do. I think it can be mediated via correct policy on a floating rate system. The problem we’ve had up to know is that TPTB have been flying the aircraft of floating rates as though they were driving a car. And then rather than blaming their lack of knowledge and skill have declared that heavier than air flight is impossible and we should go everywhere by road instead. Stephanie Kelton is the Chief Economist for the Senate Budget Committee, on which Sanders is the Ranking Democrat. One problem with Sanders’ platform is that he has not gone “full MMT” because he is adopting the “pay for” requirement for spending, and the “pay for” includes higher taxes, and not just on the very wealthy. It’s argued that a position rejecting “pay for” as to spending is politically non-viable. But the “pay for” part is also non-viable if it includes taxes — even taxes that start at e.g., $250K. The American electorate has not matured enough for a candidate to advocate higher taxes, except possibly if they are clearly only on the very wealthiest. They have not matured enough to understand what “democratic socialist” means and are susceptible to the inevitable red-baiting against Sanders in the general election. The suggestion is that all three parts of the so-called trilemma are mutually desirable. But not only are they all fuzzy in the technical sense, that is, matters of degree and kind, there is no reason to believe that a blend of them in which none of them exists in a pure state is not only optimal, but also feasible. And that may be so, regardless of one’s political orientation. To argue that we only have three options, and that one of these three has to give way to the other two is to pose a false three way division. Correction: That should be “no reason **not** to believe”. Peter Janovsky. The polling doesn’t agree with you. Even the DNC’s own polling is telling them that Sanders is more likely to win, or electable in media terminology, against Trump or any other Repub than La Clinton. It shows that Clinton would lose to Trump and would be close run by any of the others. This does not make the DNC happy I can assure you. So is the fact that the Australian Federal Government has foisted FTAs, TPP and GPA on us without meaningful consultation proof of Rodrik’s assertion “… the shrinkage of politics would get reflected in the insulation of economic policy-making bodies (central banks, fiscal authorities, and so on) from political participation and debate,”?